Kleefeld on Comics: On History: Got a Spare $70k? 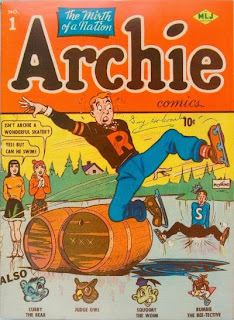 While the character of Archie Andrews debuted in Pep Comics #22 from late 1941, he became enough of a hit to warrant his own title in 1942. The character soon found himself the focus of several titles, so much so that MLJ Magazines changed its name to Archie Comics, and all but dropped everything non-Archie related. Archie Comics have been published continuously since 1942. Through the book burnings and Senate subcommittee hearings, through the birth of the direct market, through the special cover incentive bubble, through every part of the roller coaster that is the comics industry. That is some long-standing history, especially for a perpetual high school student! And while there have been slumps in the creativity afforded the comic, there have been some really impressive moves in the creative direction of the stories in recent years, largely thanks to Dan Parent. He's helped to make Archie Comics an aggressively more progressive company than any of its publishing peers. Needless to say, there's plenty of history that could be covered in writing about Archie. But, now, for $70,000 you can own every single issue of Archie Comics. Not reprints, not digital copies. The original print issues. Every. Single. Issue. Ever. Over 630 individual issues, from 1942 until today. Up for sale on ebay. I don't have anything really to add to that besides... wow.